If you ever travel U.S. Highway 30 across Iowa, you’re never far away from the Lincoln Highway, if not right on top of it. If you’ve ever driven on Interstates 80 or 35, you’re also enjoying a legacy of fast, efficient transportation that took root with the Lincoln Highway more than 100 years ago. I was reminded of the Lincoln Highway’s pivotal role when I shared my “Culinary History of Iowa” program with 100+ Lincoln Highway enthusiasts from New York to California who met in Denison from June 20-24 for the Lincoln Highway Association’s 2017 annual conference. As attendees shared their stories with me, it was clear the Lincoln Highway’s magic hasn’t waned through the decades. Perhaps we should all thank the founders of the Lincoln Highway for helping get rural Iowa out of the mud. Oh, that mud! It’s obvious why Iowa needed to get out of the mud 100+ years ago. 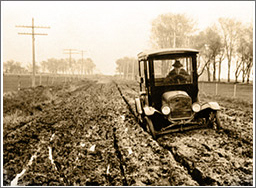 As late as 1912, road conditions in the United States and Iowa were often deplorable, especially in rural areas. Few roads in the countryside were graded, and maintenance fell to those who lived along them. The lack of paved roadways meant travel was always dominated by the weather. In wet weather, roads turned to mud and became impassable. During the winter months, you could be stranded on the farm for weeks if snowdrifts blocked the roads. Iowans, like most Americans, were frustrated by poor road conditions, especially as the automobile’s popularity took off. Indiana native Carl Graham Fisher envisioned a solution. A tireless promoter of the automobile industry, Fisher had a track record of success, having joined a group of Indianapolis businessmen who invested in what became the Indianapolis Motor Speedway. At a dinner meeting in 1912 in Indianapolis, Fisher proposed the idea of a highway that would span America from coast to coast. Stretching nearly 3,400 miles, this “rock highway” named in honor of President Abraham Lincoln would follow the shortest, fastest, most practical route. Fisher’s goal was to finish the highway by the 1915 Panama-Pacific Exposition. The highway’s path would run from New York City to the Exposition’s host city of San Francisco. Belle Plaine, Iowa, celebrates its rich Lincoln Highway history. Established in 1913, the Lincoln Highway transformed automobile travel from a tortuous journey to an exciting adventure. In Iowa, the Lincoln Highway was built from Clinton to Council Bluffs, connecting the Main Streets of 43 communities along the way. As the first coast-to-coast highway, the Lincoln Highway demonstrated the power of good roads for transportation and commerce. It accelerated the Good Roads Movement, which helped get Iowa and other states out of the mud. On a national scale, the Federal Highway Administration and interstate highway system decades later marked the culmination of these efforts. 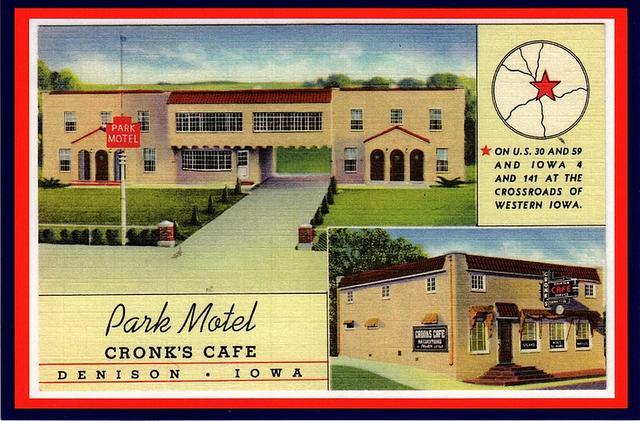 This vintage postcard shows the historic Park Motel and Cronk’s Cafe in Denison along the Lincoln Highway. • Stop on a whim. If you see an intriguing café, go in. I recently stopped at the Lincoln Café in Belle Plaine and enjoyed a delicious bowl of vegetable beef and noodle soup, an Italian beef sandwich and coleslaw, along with a side of history. This café has served locals and travelers since 1928. • Pause to take in the view. It usually takes me awhile to get to my destination, because I stop often to capture rural Iowa’s beauty with my camera. 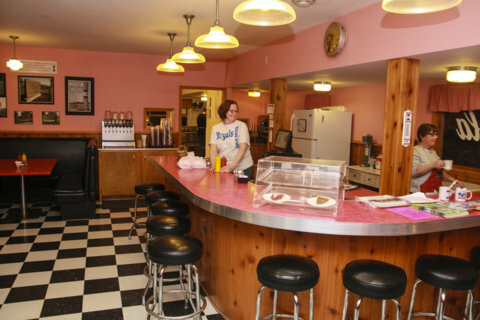 The Reed-Niland Corner in Colo has served travelers since the 1920s and is likely the only remaining spot on the entire Lincoln Highway that still features a café (try their homemade ham-and-bean soup and a slice of pie! ), vintage gas station and motel. • Eat local. I love supporting locally-owned businesses that preserve the history of the Lincoln Highway, from the Santa Maria Winery in Carroll to the fabulous Reed-Niland Corner in Colo. 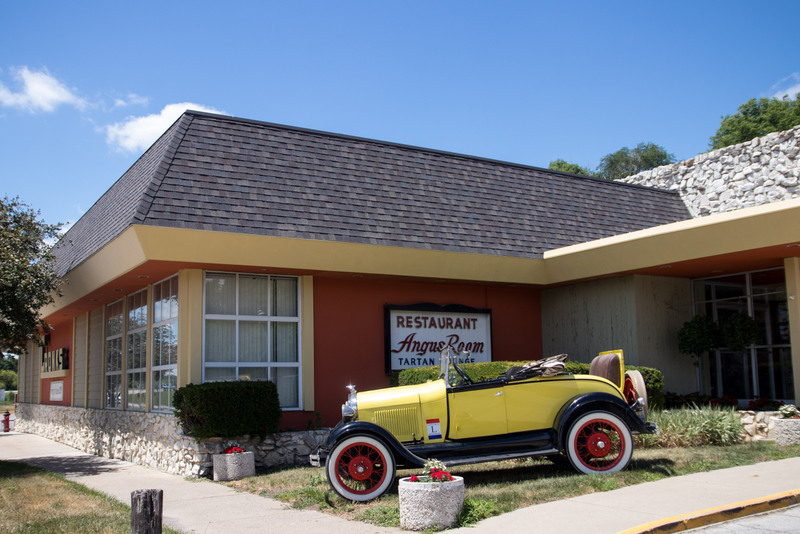 This Story County treasure has served travelers since the 1920s and is likely the only remaining spot on the entire Lincoln Highway that still features a café (try their homemade ham-and-bean soup and a slice of pie! ), vintage gas station and motel. 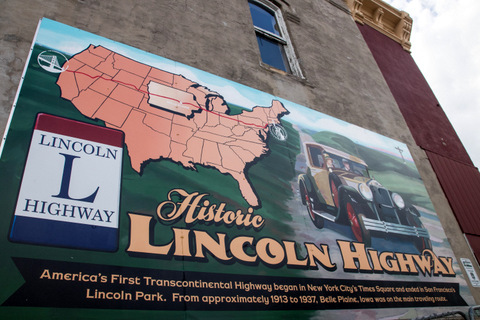 No matter where your summer road trips take you in Iowa and beyond, long live the legacy of the iconic Lincoln Highway! This story first appeared in my Farm News column in June 2017. Thanks for stopping by. I invite you to read more of my blog posts if you want more more intriguing Iowa stories and history, along with Iowa food, recipes and tips to make you a better communicator. If you like what you see and want to be notified when I post new stories, be sure to click on the “subscribe to blog updates/newsletter” button at the top of this page. Feel free to share this information with friends and colleagues who might be interested, too. If you’re hungry for more stories of Iowa history, check out my top-selling “Culinary History of Iowa: Sweet Corn, Pork Tenderloins, Maid-Rites and More” book from The History Press, as well as my Calhoun County” book from Arcadia Publishing, which showcases the history of small-town and rural Iowa. Order your signed copies today! Iowa postcards are available in my online store, too. Let’s stay in touch. I’m at darcy@darcymaulsby.com. Some people know me as Darcy Dougherty Maulsby, while others call me Yettergirl. I grew up on a Century Farm between Lake City and Yetter and am proud to call Calhoun County, Iowa, home. I’m an author, writer, marketer, business owner and entrepreneur who specializes in agriculture. Learn more at www.darcymaulsby.com. 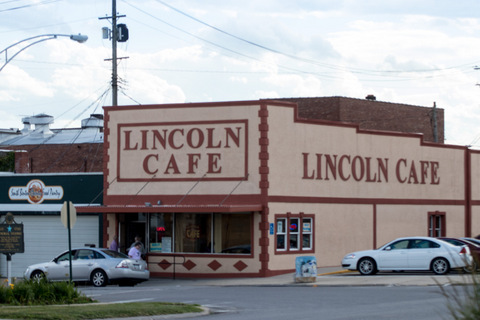 The historic Lincoln Cafe in Belle Plaine has served home-cooked food along the Lincoln Highway since 1928.